The Ritz-Carlton residence of the late heiress and philanthropist Sandra Helen Payson and her first husband, New York real estate developer William Blair Meyer, has been sold. Ms. Payson, who was also married for a time to Lord George Weidenfeld, the British publisher, was the greatgranddaughter of William Collins Whitney, and the granddaughter of Payne Whitney, who, as heir to the Eli Whitney cotton gin fortune, was at the time of his death in 1927, the third-wealthiest man in America. Payson’s mother, the late Joan Whitney Payson, co-founded the New York Mets with George Herbert Walker, Jr., who in the 1980’s, helped his nephew, former President George H.W. Bush, get into the oil business. In a family of wealthy Republican supporters, including her uncle John Hay Whitney, Ms. Payson stood out as a major donor to the Democratic National Committee. A self-described entrepreneur, she bred racehorses, owned a track and stables, founded the Beard’s Fund to benefit the arts, and served as board member of the Madeira School and the Whitney Museum in New York. She died last summer at age 78. Her Unit S7D at 1111 23rd Street NW was listed by Washington Fine Properties agent Giselle Theberge and sold for $1,010,000. The buyers are Gary M. Beer, CEO, Smithsonian Business Ventures, and his wife, Peggy. Washington Fine Properties Mathew McCormick and Patrick Chauvin, represented the couple in the transaction. Long & Foster realtors Charlie Hein and Terri Robinson listed and sold a beautiful Harry Wardman-designed house across from the Maret School in Woodley Park, one of the city’s finest neighborhoods. Harry Wardman, often referred to as “the man who built Washington,” in fact built 9,000 homes in the District and in 1918 opened the 1,000- room Wardman Park Hotel, now the Marriott Wardman Park Hotel and Convention Center. The house located at 3025 Cathedral Avenue NW, features exquisite exterior masonry work and stone columns at the entranceway that Wardman copied from an Irish farmhouse. It also boasts hardwood floors and beautiful plaster moldings in the public rooms and in the master bedroom suite. The “Garfield” model Colonial was built in 1926 and has a traditional floor plan with a center hallway. There are six spacious bedrooms, four on the second floor and two on the third level that offer lovely views of National Cathedral. The home is situated on a deep lot with a garage and space to park five cars and is located near the Woodley metro stop, within easy reach of no fewer than twenty-five restaurants. The property was listed at $1,750,000, sold “as is” with a closing price tag of $1,580,000. The sellers were Sarah and Grace Daughtridge, sisters whose parents owned the house for over forty years. Sarah is an internist in North Carolina. Grace, a 1983 graduate of the Maret School, lives in Washington. The buyer is Herbert Cupo, Chief of the Office of Naval Operations. Mark A. 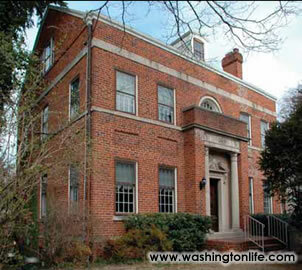 Green and Michael W. Rankin of the real estate company Tutt, Taylor and Rankin, have sold their seven-bedroom Colonial at 2344 California Street NW for a reported $4.7 million. The beautifully proportioned Kalorama residence was built in 1922 and features a grand scale living room that opens to a study and sunroom. Perfect for both formal and informal entertaining, there is an eat-in kitchen with a separate breakfast room overlooking the landscaped grounds. The large dining room opens to the patio and a lovely walled garden. The exceptional 9,750 square-foot fenced lot has an underground sprinkler system. The new owner is Kenneth D. Brody, a former Export-Import Bank president and founding partner of Winslow Partners, LLC. Brody also spent two decades at Goldman, Sachs & Co. and is co-founder of the investment firm Taconic Capital Advisors, LLC. In 1999 he established the Carolyn and Kenneth D. Brody Foundation, which consistently has ranked among the District’s top twenty-five most generous foundations. Almost a year after her death, Sandra H. Payson’s Virginia Hunt Country estate has also been sold and is now deeded to Luann L. Bennett. Bennett is the third wife of Rep. Terry Moran (D-Va.) and president and owner of RAB Management, Inc. a Washington real estate services firm specializing in leasing, construction and property management. Ms. Payson’s property, known as “Ashleigh,” is located at 3252 Winchester Road, in Delaplane in scenic northwestern Fauquier County and has been designated in both the Virginia Register of Historic Properties and the National Register of Historic Places. 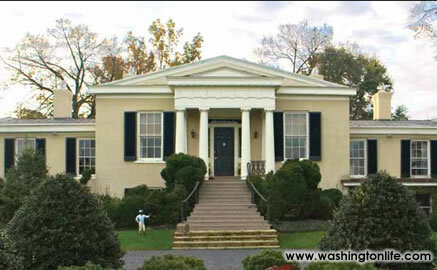 Built circa 1840, the Greek Revival manor house was originally home to Margaret Marshall, the granddaughter of Chief Justice John Marshall, and was built on land she was given from the family’s Oak Hill estate. 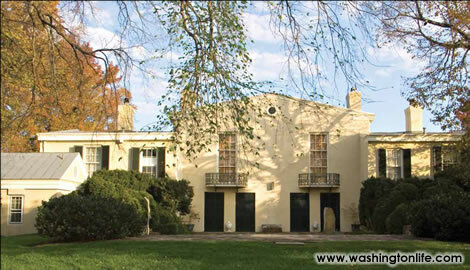 The five-bedroom house is constructed of stone covered with stucco and contains fine period woodwork including hardwood floors and pine paneling removed from the White House during the Hoover administration. Designed for entertaining, the main floor has a large entrance hall and embassy-size living room with fireplaces at each end. French doors lead from the dining room to a stone terrace. An octagonal brick addition was built in 2001 to serve as a library. Beautifully sited on a hill atop almost a hundred acres, “Ashleigh” is surrounded by beautiful countryside and has magnificent mountain views. Large boxwood hedges and exquisite flowering gardens with arbors further enhance the home’s pastoral setting. The grounds also include heated pool, pool house, pond, caretaker’s house, ten-stall stable with courtyard, groom’s apartment connected to the stable, runin sheds, large paddocks with four board fencing, and a machine shed. The property was listed for $3.8 million by realtor Gloria Armfield, of Armfield, Miller & Ripley, Inc., which in September, merged with Washington Fine Properties, LLC. Both firms are affiliates of Sotheby’s International Realty and Regents members of Who’s Who in Luxury Real Estate. According to Dana Landry, the principal broker of Washington Fine Properties, “In recent years there have been an increasing number of buyers in the D.C. area looking for second homes in the Virginia countryside. By having this reputable company as a part of our operations, we will effectively extend our coverage to seamlessly serve our clients’ real estate needs.” With the merger, Washington Fine Properties gains more than fifty sales associates and expands its services to Clarke, Culpeper, Fauquier, Loudoun, Madison, Page, Rappahannock, and Shenandoahcounties.